It was one oversized cheque after another as Drake shot his new video for God's Plan in Miami last week, and now we know why. A nearly six-minute video for his new single was released Friday, with the feature players consisting of joyful — and sometimes tearful — people receiving gifts from the 6 God. Drake called the video "the most important thing I have ever done in my career" in an Instagram post. The video opens silently with just these words appearing on the screen: "The budget for this video was $996,631.90 [US]. We gave it all away. 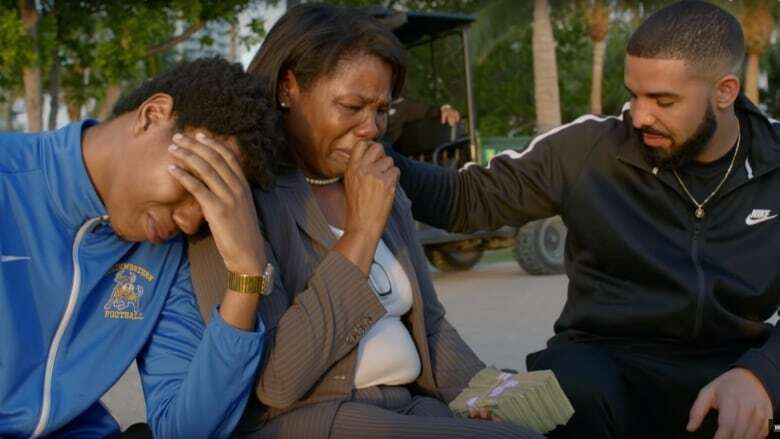 Don't tell the label …"
Last week, the Toronto rapper made headlines by popping up in various Miami locations, giving away thousands of dollars to lucky recipients. Among many other giveaways, Drake gave Miami Senior High a $25,000 cheque and said he would help design new school uniforms. He also gave an impromptu concert at the University of Miami, where he awarded a $50,000 scholarship to a lucky student. The Miami Herald reported Drake paid the grocery bills of every shopper inside a Sabor Tropical supermarket. He also gave $50,000 to a non-profit for a homeless shelter where he also dropped $150 Target gift cards for all 130 women residents.